Reena, a serial entrepreneur and philanthropist, interestingly dove into entrepreneurship when most women take a career break, after her first child was born. She began with a staffing company, Avankia, then moved on to TargetRecruit, the most innovative talent management platform built on the Salesforce platform, that modernizes the recruiting cycle at organizations, from front to back office. 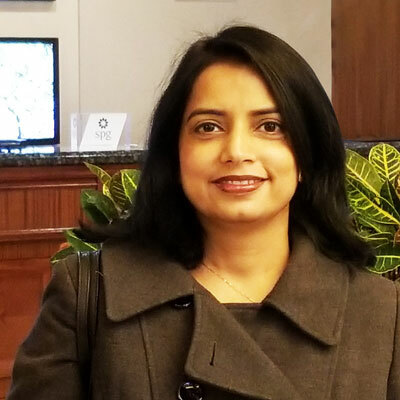 Reena was featured as CRN's 2016 Women of the Channel, in Entrepreneur Magazine, Power 50 Solution Providers and much more. From supporting girls' education to providing job opportunities to moms on career break at her firm, Reena always strives to do her part to support women. In this pursuit, she has embarked on the journey of Mom Relaunch- an initiative to bring women on a career break back into the workforce. Mom Relaunch is a one-stop solution for moms to have a fulfilling and sustainable career in the HR and IT industry. We constantly work towards making our customers lives simpler. This includes two things- Innovation and Operationalization. We continuously innovate our products to stay ahead of the trends in staffing and recruiting by developing advanced features and modules so our clients can continue to use one integrated platform to run their business. We also help our clients realize the full potential of our products, so that they can directly affect their business profitability. For instance, we launched VMS last year and now we are working with existing VMS customers be achieve low cost-to-hire. I was one of the three finalists of Dreampitch at TrailheaDX by Salesforce (https://www.salesforce.com/video/1074483/). TargetRecruit was featured in Top 10 Recruitment Software Solution Providers 2017 by HR Tech Outlook Magazine (https://www.targetrecruit.net/TargetRecruit-featured-in-Top-10-Recruitment-Software-Solution-Providers-2017). In addition to this, I recently did a lot of interviews and podcasts- WinWin@Work (http://www.winwinatwork.com/interview-reena-gupta-ceo-mom-relaunch/) , The Other 50% (http://theotherfiftypercent.com/new-blog-1/2017/10/12/episode-13-reena-gupta-entrepreneur-founder), B2B Next (http://b2bnxt.com/from-consulting-to-products-conquering-one-niche-at-a-time/) and others. Melinda Gates for her philanthropic work (Bill and Melinda Gates Foundation: global health and education) and strong passion for women's education. Her philanthropic initiatives in India, specially my home town- Danapur, Bihar have always impressed me. In April of 2015, she visited Danapur, accompanied by Sudha Varghase who runs the program, along with two of her colleagues from her own foundation (http://www.cbsnews.com/pictures/bill-melinda-gates-foundation-work/11/). It really meant a great deal to me to see her spending time in the villages I once grew up in, and most importantly to help these young girls in their future. I would have told my 16-year-old self to make the most of that age- have fun, enjoy life, bunk some classes, pursue crazy ideas and celebrate little wins. It is so satisfying to look back at all the crazy things done as well as saddening to think about what I couldn't do. I didn't have so much luxury when I was young, but I do encourage my kids to never inhibit themselves. Another advice to my younger self would be to master the art of Time Management and task prioritization. It has great benefits- improved focus, reduced stress and more. This may not be a new job related skill, but I would like to excel at communication and I constantly work towards it. No two people in this world would communicate an idea in the same way, but what makes a difference is how they communicate. It's a skill that needs constant enhancement and gives you an upper hand in conversations. Now that the world is way more digitized than before, with a few face-to-face conversations, it is all the more critical to express your ideas and thoughts appropriately and succulently. Recently I read the book "Option B" by Sheryl Sandberg and I would highly recommend it. Everyone faces adversities in life, be it professional or personal. The book explores how people bounce back after an adverse experience in their lives and some even bounce forward. It offers great insights into how we can raise strong children, who will eventually create resilient society and workplaces. A sad event or mishap should not be able to shatter our endeavours of finding meaning, love and joy in our lives. Rather, it should push us to kick back and breathe again.